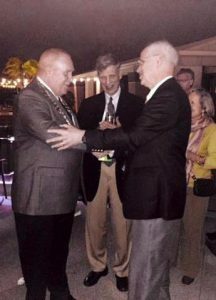 What an honor it was to be inducted as your new President on St. Patrick's Day during our 2017 Irish-American Orthopaedic Society reception held in beautiful San Diego, California. Many of you may already know me, but for those who don't, here is a very brief history. I earned my medical degree from the Uniformed Services University of the Health Sciences, where I continue to serve as Assistant Professor of Surgery. I trained at Bethesda Maryland Naval Hospital, honing my skills as a shoulder and upper extremity surgeon. As a Naval Flight Surgeon, I had the extreme pleasure to work as a member of the Space Shuttle Recovery Team and I worked with the Navy Flight Demonstration team, the Blue Angels. After my 16-year Navy medial career, I settled in Cape Cod to practice orthopaedic surgery, with the goal of merging the high-tech ability of university-level hospitals with the one-on-one doctor/patient relationship seen in small community hospitals. Now established as the "Shoulder Guy", I perform reconstructive shoulder procedures, as well as total shoulder replacements for arthritis and post-traumatic conditions. And, now, as your new IAOS President, I would like to thank Dr. Eddie McDevitt for his exemplary service as our society's President over the past two years. The Irish-American Orthopaedic Society embodies a unique and wonderful heritage, and I urge you to reach out to me with any ideas or suggestions you may have to help our organization grow as we continue to contribute to the field of orthopaedic surgery. Also, I'd like to remind you to pay your 2017 dues in support of our association. By keeping your 2017 dues current, then paying your dues next year for 2018, you will be eligible to attend the 2018 IAOS meeting in the scenic town of Westport, in County Mayo, Ireland. Once again, our meeting will coincide with the Mayo Arthroplasty Conference, being held in the beautiful Knockranny House Hotel on April 20-22, 2018. Don't miss this great opportunity to embrace your Irish heritage and meet with friends and fellow colleagues!